Dr. Scott Peters was born in La Jolla, California while his father, then a Navy dentist, was stationed at Camp Pendleton. Shortly thereafter his family moved to his father's hometown of Fresno California where his father opened a private dental practice. After graduating high school in Fresno Dr. Peters attended UC Berkeley where he studied biological science. He earned his degree in Biological Science and then attended University of the Pacific Dental School where he earned his DDS degree. 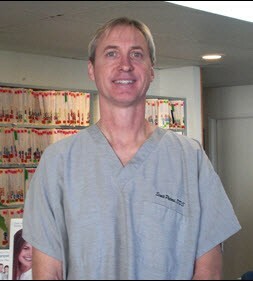 Dr. Peters returned to Fresno and took over his father's family and cosmetic dental practice. He practiced in Fresno until March of 2010 when he moved to Carlsbad. He has had over 15 years of experience as a family and cosmetic dentist and stays abreast of and employs many of the latest techniques. Outside interests include skiing, surfing, biking, and other outdoor activities. He now devotes most of his free time to his son who was born in March of 2010.